A WOKING school pupil has helped to show the Government’s leading parties the way forward in the fight against climate change. 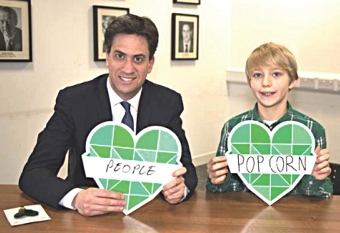 Noah Brierley, 10, recently met the Labour Party Leader Ed Miliband as the MP signed an important climate-change agreement alongside David Cameron and Nick Clegg. The youngster took action as part of the national Show The Love campaign organised by The Climate Coalition to ‘celebrate the things we love that could be lost as a result of climate change’. The three leaders pledged to work together to tackle climate change regardless of the outcome of the May election, having agreed that it is one of the most serious threats facing us. Noah, who has visited the Woking-based WWF-UK building several times, is particularly concerned about the disappearance of the Amazon rainforest and one of his favourite snacks – popcorn. He will also be taking part in an Eco-week in March organised by the Woking United Reformed Church, where he will learn about recycling, renewable energy and energy saving. Noah said: “I don’t want to lose popcorn because it is a nice food, and it is so nice to enjoy it with your friends. Supported by more than 100 organisations, including CAFOD, Christian Aid, Oxfam, the RSPB and WWF, the campaign wants individuals to ‘show the love’. The Show Your Love campaign is being launched as we enter a crucial year in the battle against climate change. In December a UN meeting in Paris will endeavour to reach an international agreement on capping global carbon emissions. Such an agreement could well be vital if we are to ensure global temperature rises are kept in check.